Trampolines are great for exercise and for providing plenty of aerial fun! So whether you have a small patio or a massive outdoor space our trampoline sale UK posts have everything you are looking for. Our community of bargain hunters have rounded out some of the cheapest trampoline deals, voucher codes, discount codes and offers on sale from retailers like Asda, Tesco and B&M. STUDIO FLASH SALE: EXTRA 50% OFF! 8ft Trampoline and Enclosure £44.99! Is This the Cheapest Price 10ft Trampoline in the UK? PROBABLY! Looking for a trampoline sale in the UK? Trampolines are a fun way to get some exercise and to bond with your loved ones. It provides plenty of play value for everyone compared to most outdoor toys. It will keep you and your family fit and energized as well. However, it can be overwhelming to shop and know what you’re really should be getting as there are factors you need to consider like size, shape and price. 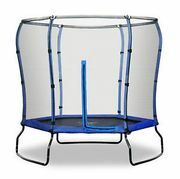 Here at Latest Deals we’ll help you find the perfect trampoline for you, your family and wallet easy with this article. Not only will you find tips and guides to find the ideal trampoline, but you’ll also amazing savings from the latest trampoline sale UK posted and verified by our massive community of bargain hunters both online and in-store from retailers such as Tesco, Argos, B&M, Asda and more. From trampoline 12ft in size to 8ft trampoline with enclosure, we’ve got your back. A minimum overhead clearance of 7.5m is required. There should also be a 2m clearance from objects where you will place it such as bushes and fences even if your trampoline comes with an enclosure. It should be placed on a level ground. The preferred surface for trampolines is grass as hard surfaces tend to add stress to its frame which can decrease its life span. Never ever place any objects under it. Circular trampoline. This type features springs that are evenly distributed which will always pull users back to its centre. It is used mainly for backyard jumping. Octagonal trampoline. This trampoline features a wider jumping surface. It also offers your body a more natural position when jumping. Rectangular trampoline. This type comes with the widest jumping surface and provide more bounce with less control. If you’re into gymnastics and exercise, this is the perfect trampoline for you. What size of trampoline should I buy? Choosing the size of your trampoline will depend on several factors such as the size of your space, weight and age of the people who will use it. How the springs will react with the frame’s strength and size means that certain jumping styles will be more efficient. Say if you want to achieve a higher bounce, opt for a larger one instead. Another deciding factor will have an impact on the size of what you will buy is your experience and strength. Trampoline 8ft: Perfect for families with young kids and if you have a small garden. This size is often low which will make it easier to climb in and out without using a ladder. Trampoline 10ft: This is ideal if you have larger kids or for users heavier in weight and it can also fit on smaller gardens. 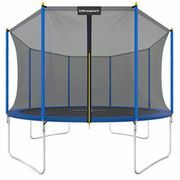 Trampoline 12ft: This seems to be the most popular size for many users. It will need a larger space though to accommodate it but it comes with a greater weight capacity. Trampoline 14ft: A trampoline this size will require a lot space in your garden and is best for people who wants practice various jumping styles and also tricks like backflips or summersaults. Trampoline 15ft: It’s the same as 14ft trampolines and ideal for those people wishing to polish their gymnastics skills. Trampoline 16ft: This is by far the biggest trampoline size and will work best if you have a really massive garden spice. It is perfect for those people who wants to practise some serious jumping techniques. Argos trampolines: Don’t miss out on Argos trampoline sale where you can get up to half price on select brands which comes with free delivery. Not only that but they also have special offers for a limited time where you can save £10 or more if you will bundle your purchase with certain items. Asda trampolines: The retailer has a nice discount of £20 on select trampoline models of Sportspower, some models even include accessories. Although it does not come with free delivery, it’s still a pretty sweet deal. Trampoline Tesco: You can choose from a wide selection of trampolines and accessories at Tesco. They have great discounts where you can save up to £104 on select trampoline sizes and around £5-£10 on select accessories. You can also find some premium trampoline 6ft in size with free standard delivery. They don’t offer free delivery on some items but you can get Clubcard points on each purchase. A survey made by Which.co.uk from 450 parents reveal that the following brands they prefer. The survery includes rate on safety, durability and ease of assembly, which are the main factors parents based their choice of which trampoline to buy. The table below shows scores that were generated based on the overall satisfaction of the respondents with the brand of the trampoline and if they will be recommending it to their friends. Poles. A trampoline will be more stable if it has more poles. Fibreglass. For a clean look, this structure holds the poles together on a ring on top of it. Arches. This links all the poles together for additional strength. It is important to replace trampoline parts over time. Make sure to read the manufacturer’s specs and instructions for your equipment’s life span. To avoid any weather and sun damage, you can keep your trampoline under a shade by using some type of cover. Always check out for parts starting to rust, worn out fabrics and malfunctioning springs each time you’re about to use your trampoline. Install your trampoline with enough space around its perimeter before using it. Jump in with your bare fee as shoes will cause some damage to the trampoline’s mat while wearing socks can increase any chance of accidents. Make sure your trampoline is dry. Never use it when wet. Allow one jumper at a time. The risk of collision and possible injury will increase if there are multiple users. No matter what age or level of experience a user has, they should always be supervised. Use it only when the weather conditions are appropriate.